Product prices and availability are accurate as of 2019-04-20 20:12:01 UTC and are subject to change. Any price and availability information displayed on http://www.amazon.com/ at the time of purchase will apply to the purchase of this product. The PRM-9000 includes the same two-inch (50.8 mm) pancake Geiger detector tube that is the gold-standard for surveying areas for potentially harmful ionizing radiation levels and for detecting radioactive contamination of packages, items, equipment and people. 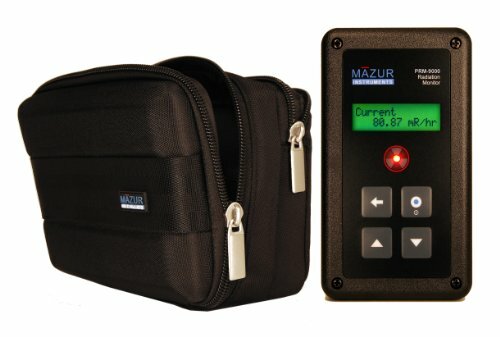 The instrument is suitable for regulatory inspections, and for the detection, measurement and monitoring of broad spectrum, low energy radionuclides, including Naturally Occurring Radioactive Material (NORM). The two-line, alphanumeric display supports both English and Japanese languages promoting ease-of-use and concise measurement. The display is backlit to support low-light conditions. Using only one key, users can scroll through several screens that display present, average, maximum and minimum measurements in uR/hr, mR/hr, uSv/hr, Counts per Second (CPS) or Counts per Minute (CPM). 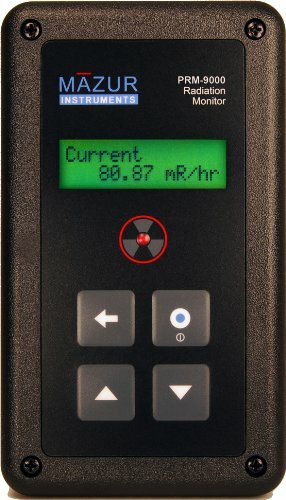 The PRM-9000 instrument not only records the maximum radiation measured, but also displays the time and date at which the maximum occurred. Battery life is over 4-years under normal conditions from a single, readily-available, 9-volt lithium battery that is user-installable without soldering. Standard alkaline 9-volt batteries available everywhere provide over 2-years of life under normal conditions. With over 100K bytes of data logging memory included, the PRM-9000 can autonomously store up to 91,466 minutes or hours of time-stamped measurements. These measurements can then be uploaded to a PC in CSV format for analysis. A user-settable dose rate alarm sounds an audible alert when the measured radiation level exceeds that of the alarm level setting. 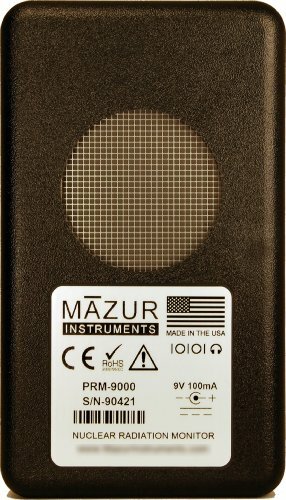 Designed by Mazur Instruments and manufactured in the USA, the PRM-9000 includes abundant I/O options including support for headphones, external speakers, external power and PC/Mac USB data exchange (requires optional 3.5mm to USB adapter cable). Minimum energy sensitivity alpha (2.5 MeV), beta (50 keV), gamma/X rays (10 keV). Gamma sensitivity: 3,500 CPM/mR/hr (Cs-137).